This morning, very early, sipping coffee on the deck, as I was trying to decide whether Dog-Dog would make a better purse or a pair of slippers (he woke us up very early), Kerri said, “What’s that?” Clinging to the corner post of the deck was a small thumb-sized alien. 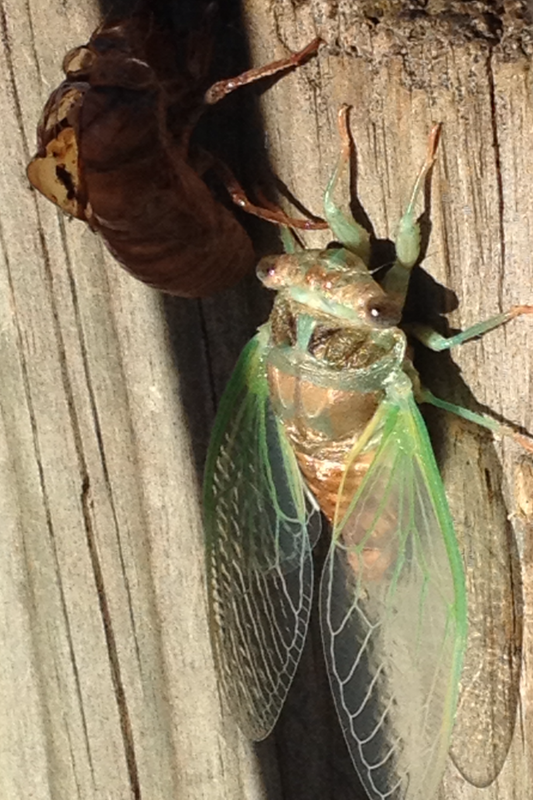 It was a cool blue green monster emerging from the splitting body of a very large red-brown scarab-esque bug. Had I not been so fascinated I would have squealed like a schoolgirl and called in Sigourney Weaver or the Air Force. 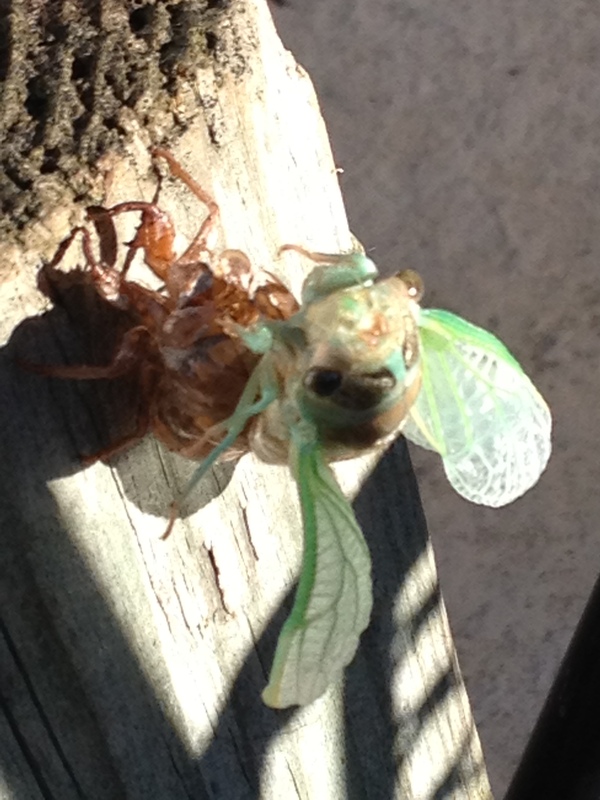 A quick Google identified the alien as a molting cicada (special note: for the next two hours we watched this miracle process. “Molting” is a word that must have been concocted by engineers or science-types; it is much too dull a word to describe the magic we witnessed. Shakespeare would never have arrived at “molting”). 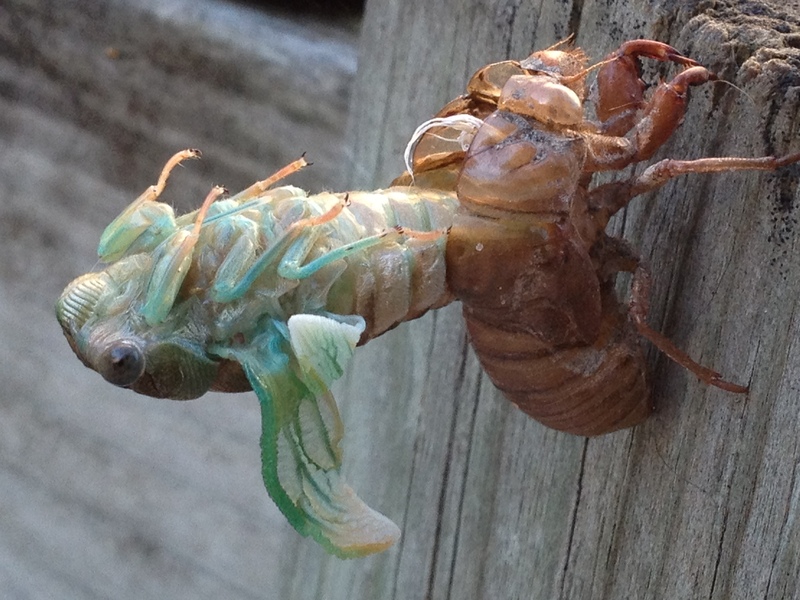 A molting cicada is goldmine of metaphor and symbolism. Since I am human and believe the world revolves around me, I took the metaphors/symbols as personal messages. The most potent was the process of emerging wings. They first appeared as tiny useless rolls that unraveled. Once unfurled, the wings were fragile and useless. They flapped helplessly in the morning breeze. And then they seemed to dry and take shape. They shimmered. The cicada pulled them into its body, tested them, and crawled into the sun. It rested. That was the reinforcement of a hard-learned message for me. Between each step, the cicada rested. Transformation is exhausting. It did not rush the process. It was not in a hurry to “get there.” It moved through a phase and rested. Each step happened as it needed to happen and rest was essential to each step. It pulled itself from the exoskeleton at just the right moment. It sat still, it rested, as its wings took form and “dried.” Once it had new form, it walked to a more protected spot and sat very still. Its body still soft and needing to harden, it rested. I do not easily rest. I am reticent to sit still and have had to learn the necessity of rest for transformation to be possible. Rest is part of the process of moving forward. Sitting still is essential to growth. Many times in my life I have argued with school boards for the necessity of daydreaming, the importance of staring out the window. Rest your mind. Relax your heart. Sit still and breathe. It is no small feat to exit a too-small-body. It is no small feat to step into uncertainty, to open yourself to new ways of being. Rest is necessary to inhabit your dreams. Tom used to say, “The readiness is all.” He knew that transformation was possible only when the person was prepared to jump. “The inner work always leads the outer.” Getting ready to jump often looks a lot like doing nothing. Resting allows the wings to dry. Wings need to dry before they are useful. After the jump it is a good idea to sit still and get used to the new body. Stare out the window with new eyes. Discover the new daydream. Rest in the miracle of new space. Go here to get my latest book, The Seer: The Mind of the Entrepreneur, Artist, Visionary, Seeker, Learner, Leader, Creator…You. Or. go here (Amazon) for hard copies.